Down have been relegated from Division One of the Football League and Monaghan are also now in danger of the drop after they were well beaten by Kerry. The Mourne County led 0-3 to 0-0 but Cork hit back to hand a sixth straight defeat to Down on a 0-12 to 0-7 margin. After being level 0-6 to 0-6 at half-time against Kerry, Monaghan collapsed to a 1-17 to 1-9 defeat at Clones. A Darren Hughes goal gave Monaghan hope in the second half but David Moran's immediate penalty sealed Kerry's win. Kerry dominated the second half as Moran and the outstanding Kieran Donaghy lorded possession in midfield. With Mayo beating Roscommon 1-11 to 1-7 at Dr Hyde Park, Monaghan are now in the relegation spot ahead of next weekend's round of games. Even victory over Donegal at Castleblayney may not be enough to save Monaghan from the drop as Mayo, who like the Farney County are now on four points, will be fancied to account for Down in their final game. Donegal are not even guaranteed safety on six points although their scoring difference is considerably superior to that of both Monaghan and Cork. However, Donegal will be fancied to win in Castleblayney against a Monaghan team whose form has dipped alarmingly since their opening wins over Roscommon and Down. The Mourne County's expected relegation was confirmed as Cork rarely had to get out of second gear to record a comfortable victory at Pairc Ui Rinn. Two Donal O'Hare frees helped Down to an early three-point lead and Cork didn't open their account until Colm O'Neill's 22nd-minute free. Mark Collins tied the scores at 0-3 apiece with the game's first point from play a minute before the break before O'Neill edged Cork ahead in injury-time. However, Down keeper Michael Cunningham had needed to make two fine stops to prevent Cork goals in the first period and the home side hit four unanswered scores after the break to establish firm control. Cork led 0-10 to 0-5 with eight minutes left and the margin remained five at the finish. Monaghan looked a far cry from the side which defeated Donegal in last summer's Ulster Final as they were outclassed by the Kingdom at Clones. The first half was even, but Monaghan once again had to rely on Conor McManus for more than half their scores as he contributed four frees. However, Kerry cut loose after the break to hit six unanswered points as Monaghan were starved of midfield possession with Donaghy and Moran winning a series of Farney kick-outs. Half-time substitute Alan Fitzgerald also made a significant contribution as he fired three points from play. Totally against the run of play, Darren Hughes, who like several Monaghan forwards struggled for the most part, bundled in a 57th-minute goal to cut Kerry's lead to three. However, Donaghy's superb long-range point in response was quickly followed by Moran's successful penalty after a misdirected Rory Beggan kick-out had forced Drew Wylie to concede a penalty, as he bundled over Paul Murphy. Colm Cooper was taken off late on after notching six points and his replacement Barry John Keane, who surely would be a regular starter for virtually every other county, contributed two late Kingdom scores. To finish off a miserable afternoon for Monaghan, they had Dessie Mone sent off late on after he was handed a second yellow card. 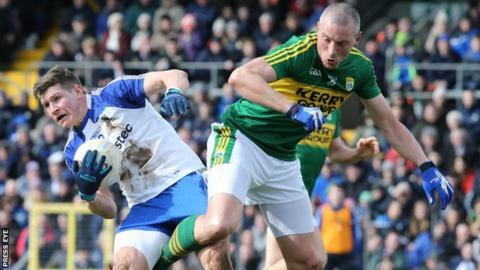 Kerry's victory puts them on course for the semi-finals although they may need to avoid defeat against Cork in Tralee next weekend to be absolutely certain of progressing to the last four.